Front pocket provides ball storage. Laser-perforated wet/dry compartment helps keep gear clean and organized. Mesh pocket on the side for water bottle storage. Curved shoulder straps and back panel are padded for comfortable carrying. Large, dual-zippered main compartment provides secure storage for your gear. Back pocket features a felt interior for phone or key storage. 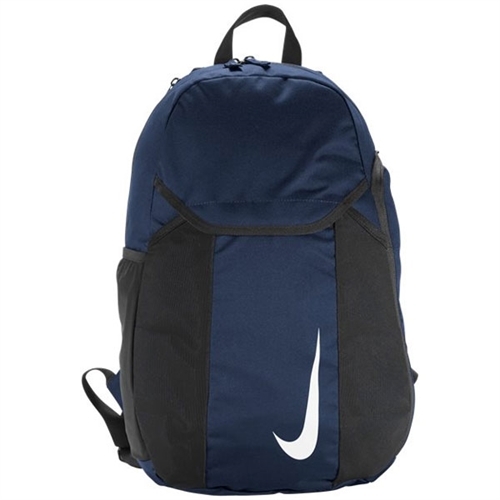 Our Nike Academy Team Backpack is reinforced with tarpaulin bottom and separate compartments for your cleats, ball and everything else that practice and game-day requires, delivers functional storage for the serious athlete.